Cllr Alexander Redpath (left) with Ulster Orchestra Managing Director Richard Wigley. The Ulster Orchestra will hold its largest ever Lisburn concert during its upcoming season, it has been confirmed. 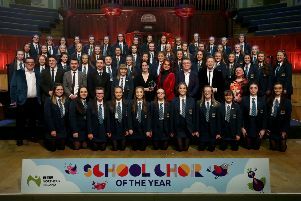 Local UUP Councillor Alexander Redpath, a director of the Ulster Orchestra, revealed that more than 40 musicians will take part in the event. Speaking at the launch of the orchestra’s 2017-2018 season, Councillor Redpath said: “It’s an enormous pleasure to serve as a director of the Ulster Orchestra. I particularly value the ability to shape the orchestra’s strategic priorities. “The Ulster Orchestra is committed to reaching audiences across the region and not just in Belfast. Next season we will be organising a large number of ‘on your doorstep’ concerts in towns across Ulster. “I am particularly pleased that the orchestra will be holding its largest ever event in Lisburn. In the new season over 40 players will visit Lisburn for a concert. Full details will be announced soon, but I hope people will support this excellent event.